salinity waters during storm events. framework (i.e., lake rim and bayou bank) within the area. pumped via a hydraulic dredge into the marsh creation sites. deteriorated marsh north of Bayou DeCade. Bayou and exits through the structures near Rice Bayou). 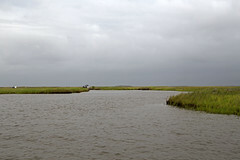 marshes north of Lost Lake. Parish, near the vicinity of Lost Lake.